Is Your Legacy Designed to Last? Your legacy is something you’ll worry about later in your career, at the edge of retirement—right? Not according to Robert Galford and Regina Maruca. In Your Leadership Legacy, these authors argue that thinking about your legacy now makes you a better leader today. After reading Your Leadership Legacy, any leader would wish that they had read it at the start of their career. It’s a book that actually forces you to think how your day-to-day actions are molding your eventual measure as a leader. Subscribe to our email list for occasional news from the authors. Robert Galford is now blogging for the National Association of Corporate Directors. Take the new, completely anonymous Leadership Styles Assessment Test. 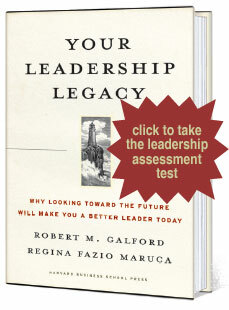 Download an excerpt from Your Leadership Legacy (PDF). Learn more about Robert Galford's earlier books, The Trusted Leader and The Trusted Advisor.